What Makes a Good Digital Angle Finder? The General Tools digital angle finder is a great addition to your tool box because it can be used for a multitude of tasks. It is most often a woodworker’s tool, so if you are a DIY woodworker, or even a professional, this tool will fit right in and make finding your exact angles much easier. The stainless steel rule-and-angle finder is a fantastic tool that provides precise measurements that you can trust. There is a lock on the finder and also reverse angle functions that makes calculating the project you are working on fast and easy. There is a hinge mechanism on the angle rule that allows 360 degrees to measure both internally, externally and reverse angles as well. This tool can be zeroed at any point in the swing. 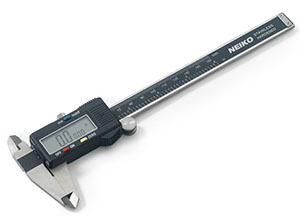 The measuring stick is 5 inches long and easily fits in any toolbox. The large, easy-to-read LCD display shows the angles easily and quickly without the user having to guess. Measurements are both standard and metric and provide you with the detailed accuracy you are looking for. The true measurements are exact miter cuts. If you need the reverse angle, just press a button to have to tool calculate it for you. These measurements can be saved with an easy press of the hold button. The large locking knob will save the angle manually. It is also ergonomic and easy to handle. This digital angle finder is the perfect choice for framing, custom furniture building, patio construction, staircase building, flooring, and virtually any type of woodworking and carpentry project. 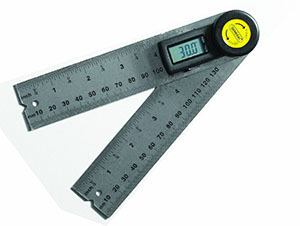 When you use this tool, you will get both interior and exterior angles in seconds. It is rugged and long-lasting. And, with the proper care, it will last for decades. It is a great choice whether you are a DIY-er that loves to work with wood or a professional carpenter. 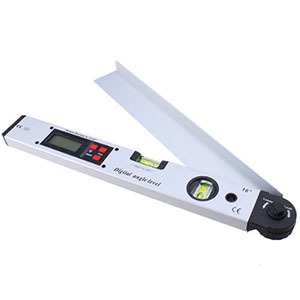 Digital angle finders are used for measuring the inside and outside of angles. They are used in many different tasks that one might need on a regular basis for projects including installing crown molding, framing projects, building stairs, constructing patios, automotive repairs, installing flooring and tiling and woodworking, carpentry and contractor projects. They are used by woodworkers, contractors, floor installers, framers, remodelers, construction workers, tile workers, automotive workers, carpenters, satellite dish installers and others who need a precise angle measurement on their projects. These tools are often seen in woodworker’s tool boxes and are very beneficial to building projects of all kinds. There are several things that you will want to look for when it comes to choosing a great digital angle finder. One of the most important features to look for is a locking feature that allows the users to lock the arms in at any angle. This is important because if you can’t lock the arms, you will have to try to hold the arms in place which makes it difficult to get an exact reading. The display should be easy-to-read and large in size so you are not squinting to see the readings. If the display is a back-lit style, then that’s even better. An auto-off feature is important for extending battery life. Sometimes a tool gets set down and not needed for an hour or so and you wouldn’t want the battery to continue to be used during this time. The auto-off feature allows the device to power off on its own and save its battery. You want to choose a model that has strong, durable construction materials like stainless steel which is rust resistant and corrosion resistant. You also want to make sure that the measurement markings are deeply etched so they don’t wear off with extended use. You want to find models with a good memory function that locks in the angle that you have set. 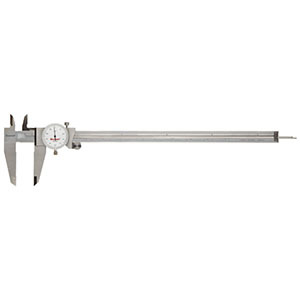 This prevents the user from having to repeatedly re-measure an angle that is used often. We started off by doing a general search for digital angle finders to get a benchmark of what features the top rated digital angle finders possessed. Once we had that information, we consulted tool magazines, forums, blogs and also interviewed experts in the industries that use digital angle finders on a regular basis. 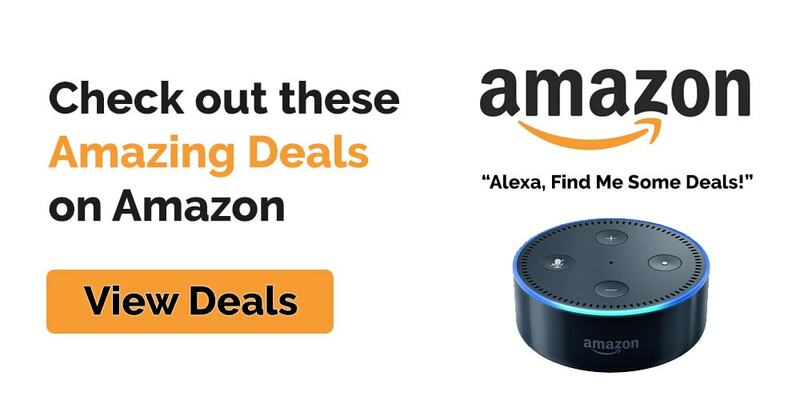 To finalize the decision on which one was the top choice, we consulted Amazon reviewers to get their feedback and comments on using the digital angle finders in real life applications. We wanted to see what they had to say about their performance and durability. Amazon gives the General Tools 822 Digital Angle Finder a 4.4 out of 5 rating from 143 reviews. A customer who purchased this product reports “This tool is great; it works as it’s intended to. We are getting ready to do some framing work along with some new trimming in our living room, so this gives us the exact angles we need for trimming around our doors. If you are looking for a high quality digital angle finder, the Wixey WR300 Digital Angle Finder will fit the bill perfectly. Ease of use and convenience are two of the benefits to this high quality finder. It is small and compact and easy to take with you anywhere you are working on your projects. The electronic display is digital and has embedded magnets. The resolution is .1 degree and has a repeatability and accuracy that is +/- .1 degree as well. The range is +/- 180 degrees which pretty much covers all of the angles you would need to measure in woodworking. The smallness of this gauge may surprise some, measuring only 2 x 2 x 1.3 inch little box. You can stick it to cast iron surfaces, band saw blades, circular saw blades, so you don’t lose track of it. This ability is due to the three disk magnets that are in the bottom of the gauge. Other simple features include an on/off button and zero buttons. All you have to do to use this great little tool is set it on a flat reference surface, press the zero button which will calibrate it and then attach it to the saw blade using magnets. Once it’s calibrated and in place, the user can set the hard stops and cut at any angle. It is a great size for handling many projects including setting saw bevel blade angles, jointer fences, band saw tables and other power tools as well. 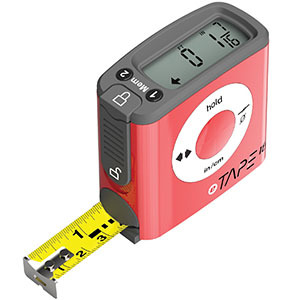 It is the perfect addition to your tool box that will provide useful information for all of your projects where angles are measured. There are some basic and easy to do maintenance tasks that will ensure you have your digital angle finder around, in great working order for a long time to come. Taking care of your tools is always important if you want to have them longer than a few months. It is very important to follow these tips so your digital angle finder provides then performance and accuracy you need. Safety is also paramount when it comes to working with tools, whether they are power tools or hand tools. Digital angle finders are not particularly dangerous tools to use, but there are some basic safety guidelines you should be aware of and follow. We have compiled a list below of safety and maintenance tips that will ensure the safest and best experience you can have with your tools. Do not use the metal digital angle finders around electrical cords, etc. Keep the digital angel finders away from children as they tend to think they are toys and could hurt each other or themselves by playing with it. 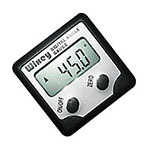 Digital Angle Finders are a great addition to a serious DIY woodworker or professional woodworker’s tool box. A digital angle finder is used for measuring inside and outside angles of whatever project you are working on. The digital feature makes it much easier to use and much moiré reliable as well. The product mentioned in this review is our top choice and with all the features it has, it’s no wonder. When you have a lot of models to choice from, there is no easy way to narrow the field unless you know what features and qualities you’re looking for ahead of time. By studying the information in this review you will have some great information that will save you time and money when you start searching for the right angle finder for your needs. We have reviewed the top choice and have written and shared our findings. We have also added an upgraded, step up for those looking for the professional quality angle finder that will be great on the work site.